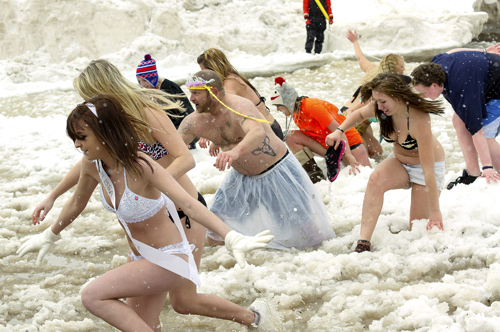 Nearly 600 swimmers participated Sunday in the 44th Olcott Polar Bear Swim for Sight cold-water excursion. Brutal cold temperatures and a brisk wind made clearing the ice from the Lake Ontario waters nearly impossible, as the chunks kept backing up. All said, a total of 573 intrepid swimmers made their way over the ice for a quick dunk through the floating chunks of water - all under the watchful eyes of the U.S. Coast Guard Rescue and Olcott Volunteer Fire Co.
Swimmers netted between $15,000 and $20,000 for Olcott Lions Club Swim for Sight programs.